First of all, I have to apologize to Audible Studios. They sent me this audiobook about a month and a half ago. Right before I got it, I had about four authors send me their audiobooks. Then life kept happening at irregular intervals, and here I am, finally reviewing an audiobook I listened to a ridiculous amount of time ago. The first thing I need to address is the quality of the audiobook itself. It’s something really special to listen to an author read their own work. It’s neat to hear how they picture the inflections, the voices, the world. Not every author is capable of narrating their own audiobook, but Daniel Jose’ Older definitely is. He has that deep, calm voice that I could listen to for hours. He brings the characters and the world to life, and really makes this incredibly wonderful series, that much better. In fact, I enjoy the audiobooks so much that, by this point, that’s the only way I can really enjoy this series anymore. Daniel Jose’ Older must read me all the books he writes. 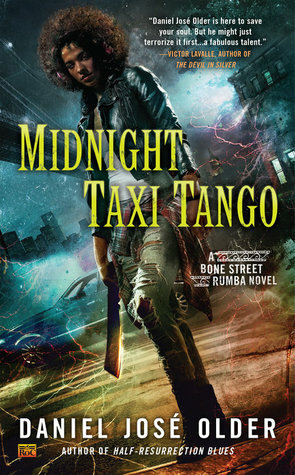 Midnight Taxi Tango is the second book in Older’s Bone Street Rumba series. You really need to read/listen to the first book before you read this one. And due to that, while I try very hard to avoid spoilers in my reviews, there will probably be some. Midnight Taxi Tango is a little different than the previous book in this series. After Carlos experienced that incredible betrayal by someone he loves, he’s left reeling a bit. His emotions are kind of messy. He’s still the same confidant, take control man that we were previously introduced to, but due to what happened before, Carlos suddenly has questions. He questions himself, he lacks trust in himself, he has darker emotions. While I do think that some readers might lament the loss of the calm, cool headed Carlos that we read about in Half-Resurrection Blues, in my mind this transitional, questioning, doubting Carlos with all his deep and messy emotions was so much more believable than if he had carried on as-is from the previous book. And it’s brave of Older to show this darker, doubting side to such a strong character. It was realistic for him to show the emotional fallout from previous events, and it is nice to read about a protagonist who grapples with those darker emotions that we all feel at times. Furthermore, this gave the book, as a whole, a more personal, deeper feeling to the characters, world, and events as a whole. Despite that, Midnight Taxi Tango is still a whole lot of fun. As with the previous book, the pace is absolutely relentless. The fact that so much of the book happens on that gray line that divides the living from the dead keeps things interesting and surprising. There are some new perspectives in this book, two women, to balance out all the masculine voices. Older seems to have a special skill for giving each of his characters a unique voice. Perhaps my one complaint is that, in a world so cunningly wrought, where Older has managed to take a city nearly everyone knows on some level and make it truly his, his antagonists stuck out like a sore thumb. Granted, the book is about a lot more than the struggle between the protagonist and the antagonist(s), but that was a detail that I couldn’t really overlook. Urban fantasy is a genre I struggle with. The shelves are overflowing with books, but very few tend to stick out to me. A lot of them feel painfully similar to each other. And while that’s not necessarily a bad thing, it makes wading through the UF genre hard for me. However, when a book or series does stick out to me, it sticks out in a big way. This series, and this author has managed to do just that. He’s taken a genre that has shelves packed full of books, and stood out head and shoulders above the crowd. The writing is superb, the story is addicting, the characters are memorable and vibrant. Most importantly, he has infused his books full of diversity, not just in skin tone, or heritage (both important) but also in what the characters are. For example, Carlos isn’t quite alive, and he’s not quite dead. He straddles the line between both, and there aren’t many individuals who do that. But most importantly, it quickly became obvious that Carlos and all the other characters don’t just stand out because they are fantastically diverse, but because they are absolutely comfortable with who they are. Their personalities shine through the pages, until they become just as real as anyone else in my life. It’s fantastic to see characters leap off the pages, and it’s wonderful to see an author who is daring to bring a positive change to a genre I love so much. So basically I can sum all this up by saying, Bone Street Rumba is an incredible series. Midnight Taxi Tango is a fun book, full of raw emotions, addicting characters, and a relentless plot. Older is one of those authors that is doing amazing things in the speculative fiction genre, and I’m really excited to see where he goes. Also, listen to the audiobook. It’s fantastic.